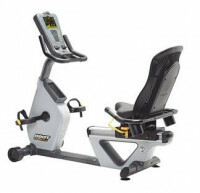 The RBK 635 recumbent bike features the P30 console and a step-through design to appeal to a wide range of exercisers. The simple seat adjustment allows the user to change the position of the seat with one hand, either on or off the bike. A ventilated air flex seat provides exceptional comfort. This bike is a cost effective option for a broad range of environments such as corporate gyms, apartment complexes and fire departments.